How many steps did you take today? Support the Cerebral Palsy Association of Newfoundland and Labrador! Challenge yourself to take 10,000 steps a day for 28 days in September! Did you know the average office worker takes just 2,500 steps a day? It’s no wonder so many of us aren't as fit as we’d like to be. It’s pretty hard to get in shape sitting down all day – so why not challenge yourself and your friends, co-workers and family members to take 10,000 steps a day for the whole month of September! In teams of four, participants track their daily step count by wearing a pedometer, and record their results on the interactive Steptember website. Each participant is challenged to walk 10,000 steps a day and as a team virtually climb the highest peak on each continent. Each team will have seven summits to climb during their journey. The number of steps it takes to reach the top of each summit is directly related to height of the summit. Each participant will reach all seven summits and the top of their virtual mountain by the end of Steptember if they reach their target steps per day. 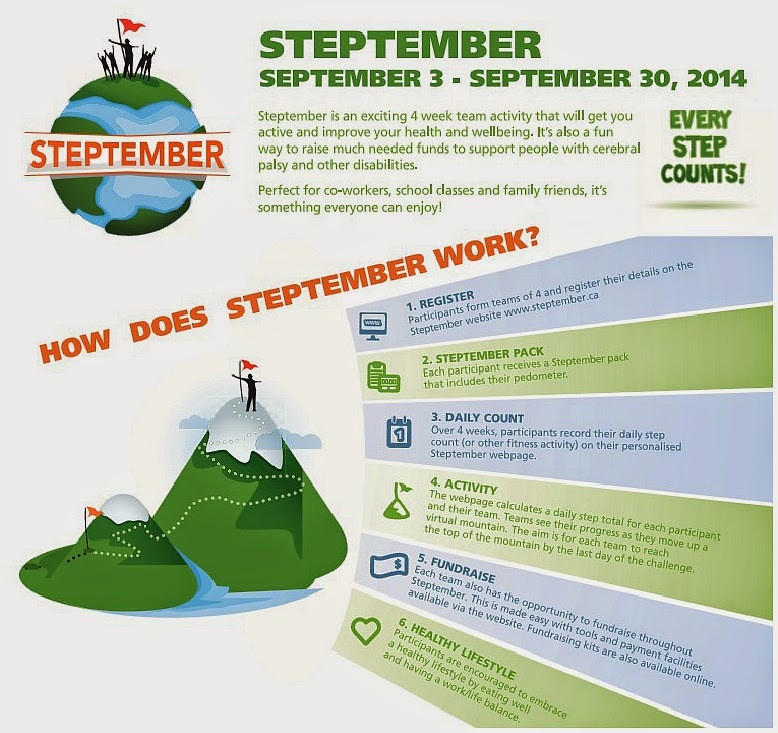 Steptember is an easy and fun way to get fit while raising funds for Cerebral Palsy Associations across Canada.